Founded in 1979 and headquartered in San Jose, California, Vander-Bend Manufacturing, LLC (“Vander-Bend” or the “Company”) is a leading provider of customized, value-added, integrated manufacturing services. As a vertically integrated company, Vander-Bend specializes in low and medium volume component and product manufacturing and complementary services primarily for the medical, semiconductor, data center infrastructure and related industries. The Company’s capabilities include sheet metal fabrication, machining, cable harness manufacturing, mechanical assembly and electronic and electro-mechanical assembly. Vander-Bend also offers its customers concurrent engineering support, especially in the early design stages. Throughout its nearly 40 year history, the Company’s established track record of consistently designing, manufacturing and delivering quality products has cemented Vander-Bend as a vital, value-add partner to its customers. Vander-Bend has enjoyed a long history of growth and profitable operations, evolving from a local sheet metal fabricator into a trusted partner for some of the most respected companies in the world. After remaining a family-owned business for nearly 40 years, its owners decided to explore their strategic alternatives in order to continue the business’ current success, and drive growth. SSG was retained by Vander-Bend to conduct a comprehensive marketing process and solicit offers for the Company from a broad universe of strategic and financial buyers. The process attracted significant interest from several parties that engaged in a thorough review of Vander-Bend and submitted offers for the business. 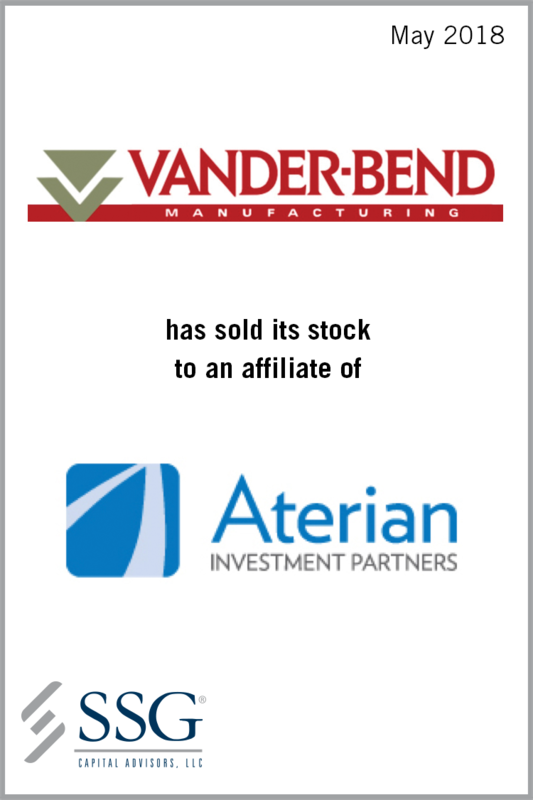 The offer from Aterian Investment Partners ultimately generated the best outcome for the Company’s owners and provides a platform for the Company’s future.